but I remember one of Nerwen's quizes I believe that cinnamon chicks can be born with red eyes and then they change to black. Looks like the red eyes are here to stay at 3-4 weeks of age. I was thinking possible fallow but dont know enough about them. 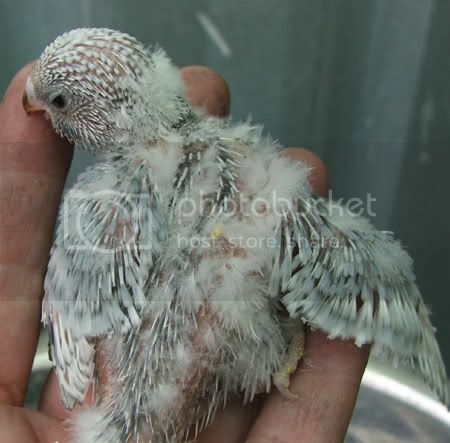 I am awaiting to see those babies can you get a spangle cinnamon mutation? I haven't heard of one yet. Here I think the males will just be split unless dad is carrying the gene to produce females. Hmmm....I wonder. Yes, Lovey. We do have cinnamon spangles from this pairing A nice surprise. 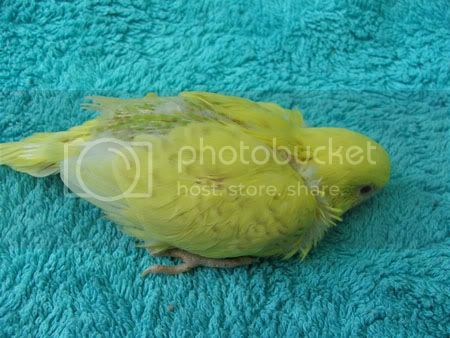 Kayas first fledged baby (female) light green cinnamon spangle ? Here is the cinnamon spangle baby Lovey. 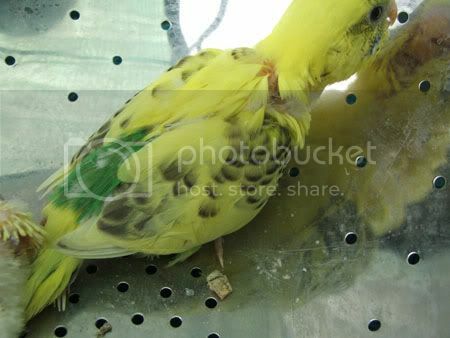 Also have a couple more in the same nest box....Kaya and Sonny's. I am about to take piks of the red eyed baby of Swift and Rocket now and will post ASAP. How pretty the spangling is not as defined but still gorgeous. She reminds me of your little hen Kayla (was that it) that you lost to the egg binding a couple months back. Expect she wasn't a spangle. What Am I ???? In the nest of Swift and Rocket we have a further surprise. 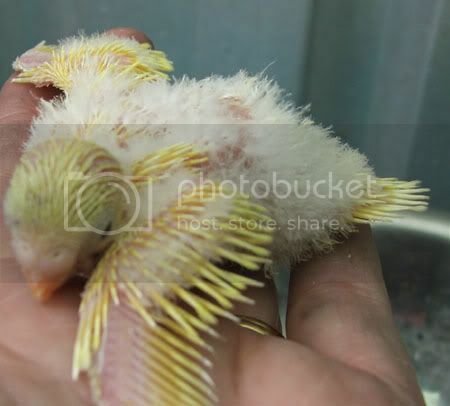 The baby that started out looking lutino, ....yellow with red eyes.....has changed colour. It now has pale cinnamon over the wings and tail and pale green on its back. 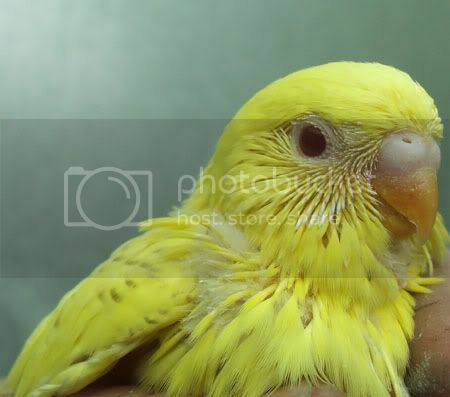 But is a red eyed yellow primarily. What is it ? Photos later today. 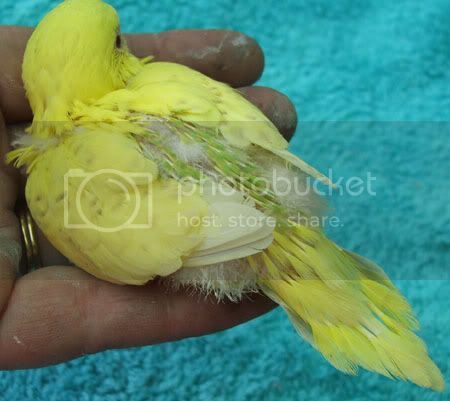 Funny you should say that....it was Tiponi who died from egg binding but she was the sister of Kaya who is the mother to this little baby. Kaya, Tiponi and Izzy were the cinnamon green babies of Kermit. 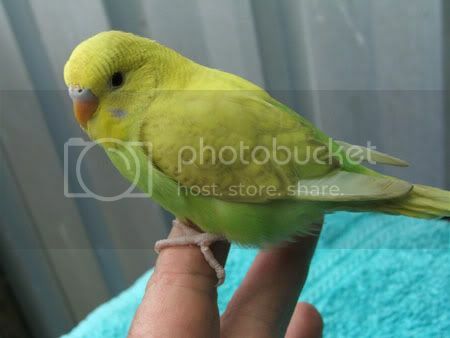 Kaya is the cinnamon green mother to this cinnamon green spangle baby who's father is a YF2 spangle. 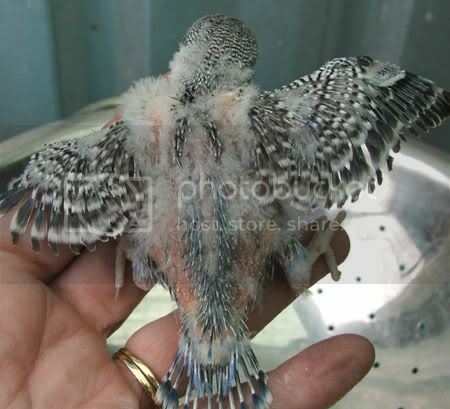 On another topic....these are the photos of one of Swift and Rockets babies. Started out looking Lutino with red eyes and now has other colour coming into play. Has red eyes still. 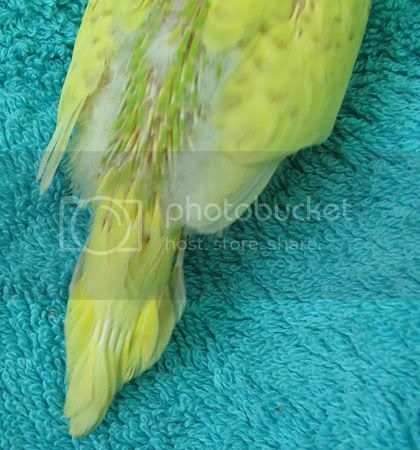 For those that cannot see the colouring properly on thier monitors....this baby budgie has cinnamon markings on wings and some tail feathers. Eyes are the brighest light red, as in a scarlet red colour not plum or not dark red. wow all these pictures My head is swimming. Stunning babies of Spot and Precious They both look blue too YAY. As to this one above, well she (?) 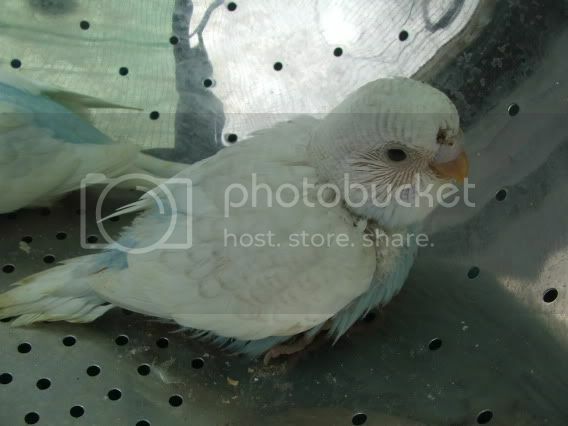 looks like a recessive pied, but the eyes are too bight for that to be all. 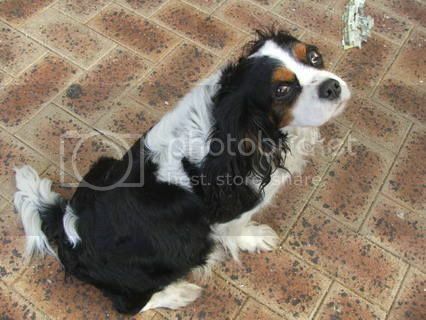 Fallow is a red eye with brown markings. It's recessive so it's possible. You didn't ask for names but Sherbert comes to mind, very pretty. : : I'm trying (Laughing out loud). 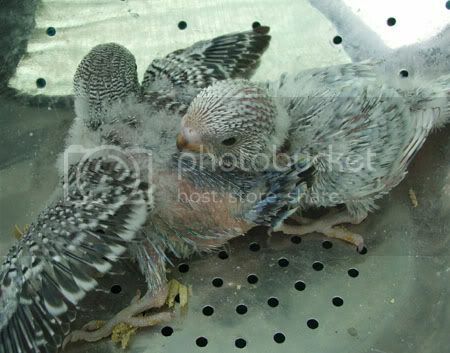 Found the answer that was bugging me which was do fallow babies start with red eyes? The answer is yes. So fallow is possible. : : I'm trying lol. 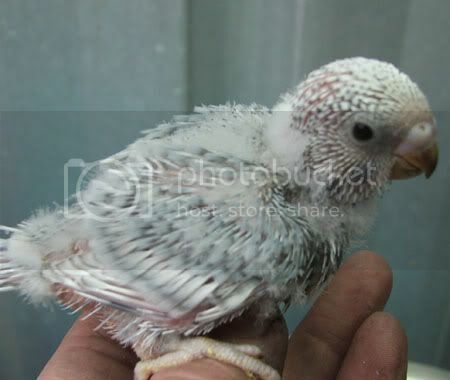 Found the answer that was bugging me which was do fallow babies start with red eyes? The answer is yes. So fallow is possible. 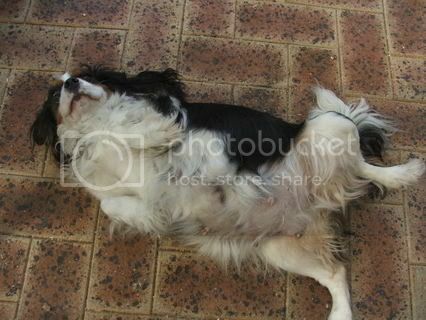 Pass says " You have a fallow "
Ciaras babies coming tomorrow. One of hers is a violet spangle. Casper and Cookies four babies weren't being well cared for. Two out of four were unfed, so the two were removed and put with another mother. The youngest baby of those two died, leaving a lutino baby still needing care. So I moved the other baby again. I took a chance on a good mum who had eggs only but no babies. So I put this baby in with Angel who is with Radar. I watched closely and saw Angel start to preen the baby all over and pull it and eggs in under her. Hopefully it will be fed and well in the morning as it was very weak when I put it in there and wouldnt take a handfeed. She is a stunner that Crystal. I may not be on for a day or so. Ken's mother has just passed away in an apparent suicide and he is very distraught. He is beating himself up emotioanlly over what he feels he should have done or not done so it hadn't happened but his mother has been chronic depressive for years and suicidal on many an occasion. Like the boy who cried wolf....eventually noone listens to the threats. Best wishes going out to you guys. 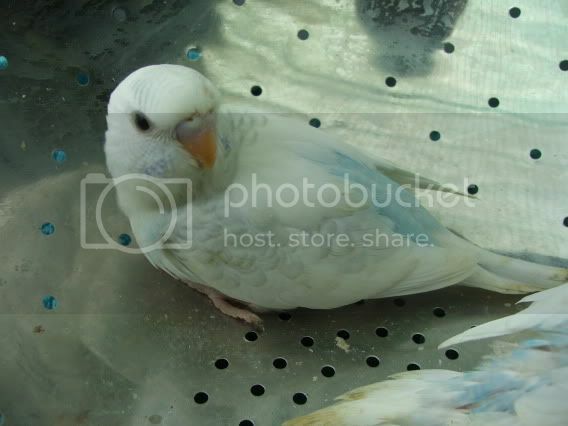 I am going with Nerwen on this one :(Laughing out loud): was it she said possible fallow (just joking) that would be my only guess other then recessive pied but the marking look spangle like Kaya. Well see there I was with the right family just not the right name with Kaya. Spot and Precious are just that look at those wings spread ready to fly mum. Side note I hope Ken is dealing okay and he is still in our thoughts. 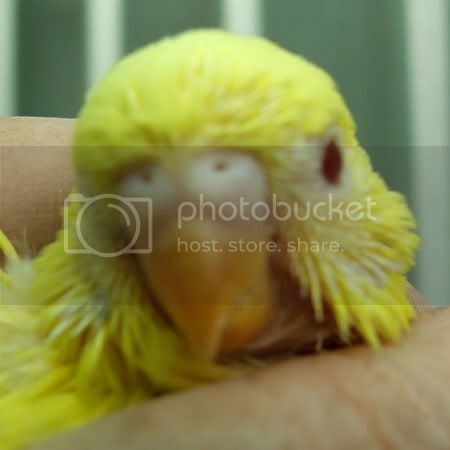 re the baby budgie.....recessive pieds have dark eyes, so that rules that out. Spangle markings....yes slightly, but the colour has only just appeared so maybe more to colour up yet. Time will tell. 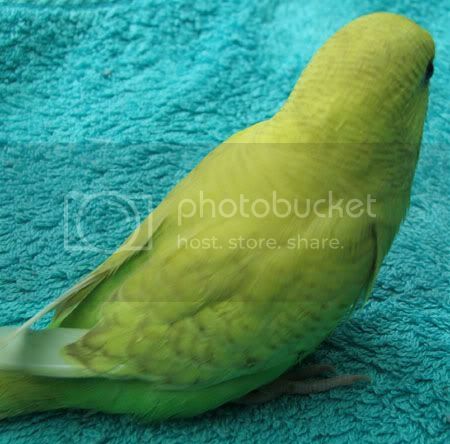 Either way she is an unusual colur budgie. The brightest red eyes. Maybe its just that all red eyed birds I have seen were either white or yellow, that makes the red look so bright with this coloration. 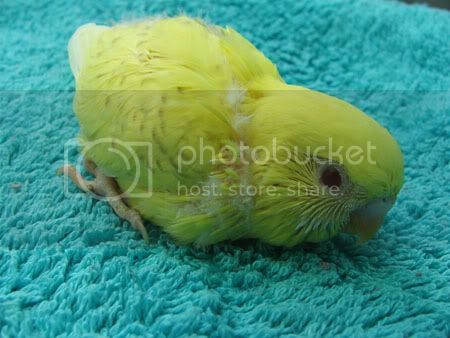 Also another yellow in the nesting box....so we wait to see what happens there (dark eyes). 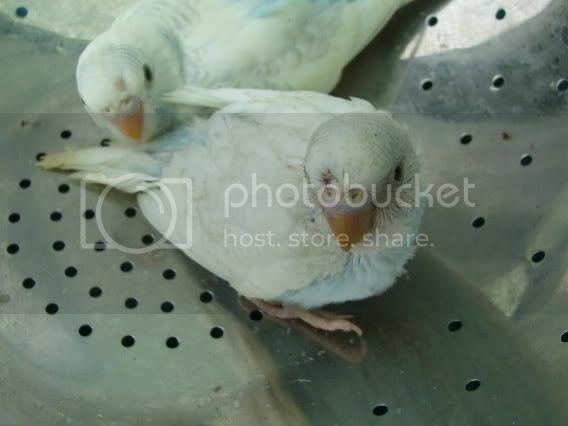 Here is photos of two of Ciaras 5 surviving babies. These two being raised by Swift. Don't rush..it will take a long while. My dad passed away a year ago this month and the pain though is not as intense it is still there and he is always in our minds. Cricket is snoring by my feet. She moans all the time. I think puppies make breathing harder. Also feels like a rugby team playing rugby in there most of the time too poor girl Cricket :budgiedance: Still, I dont think she would have more than 3 or 4 pups. We shall soon see. moaning :(Laughing out loud): I think I remember doing that too and I only had 1 in there at a time . Poor thing - at least it is cool over there and not in the dead of heat like it is in the US. Very cool on that keep us updated. I shall be thinking of Ken on Friday. As my Dad has refused medical attention today, I am in similar turmoil to him. He deserves another big hug from me. All the best with regard to your Dad Lin. Parents are tough responsibilites for us kids aren't they ? Let me know if I can help in anyway. Ken's been getting "a little crabby" the past few days...very unlike him. I'm sure he will get over it, eventually. Goliath and Jade have a 100% hatch rate this time and have 5 wriggling little pink blobs. They had Crystal last time and she's a beauty so I wonder how these will turn out. Many other little beauties coming along. Due for a mass fledging anytime between today and a fortnight.....spangles, yellowfaces...cobalt and sky, pieds, cinnamons etc. Lots of photos to come. Angel kept the unfed lutino baby warm last night but didnt feed it. It is now in Curry and Lailas box looking for a feed. Curry and Laila are dilligent in their care of babies....heres hoping. If not it will be handfed by lunchtime.